We loved AC Ryan's first foray into media extenders. The PlayOn!HD Mini walked away with the PC Format gold award thanks to its intuitive, focused way of trivialising the whole process of getting media from your PC onto the big screen. Its latest box, the PlayOn! DVR of tricks takes that basic remit and bolts on digital video recording. Available as a bare unit or with a hard drive pre-installed, this could be the box you've been waiting for. The unit boasts twin tuners, so you can record digital TV while watching another channel, or time-shift what you're watching. You can set up recordings for channels using the Electronic Programming Guide, or as this is essentially a PC in a lounge-friendly box, you can also use the web interface to set it to record whilst at work, on holiday or anywhere else where you have access to a browser. There's nothing new about Digital Video Recorders, of course, but what's new here is that it does all that while enabling you to play back media from your USB sticks and from your home networks. The unit supports a healthy number of video and audio formats, easily handling everything we threw at it without complaint. There's even a pass-through option, enabling you to plug in your DVD player or another device, although the composite audio and video connectors limit usefulness here. The back of the unit is reassuringly packed with connectors, offering 1080p HDMI, composite and y/Pb/Pr video ports along with a judicious smattering of digital audio connectors. This is also where you'll find the eSATA port, which can be used to extend the storage of the unit beyond the internal drive. You can also plug an optional USB wireless dongle into the machine to get it onto your network without stretching even more cables across your house. The machine can even be set up to handle torrents directly, although this is configured from a PC and not from the unit directly. The unit's facia is home to an LED display and a surprising number of buttons, just in case your sofa eats your remote. We found the overall boot time a tad long (as it searches the drives you've connected) and the user interface can be a little small in some instances. Even so, on the whole the interface is consistent and most tasks are well covered. The main problem we have with the PlayOn! DVR is not so much what it can do, as it actually covers its core functionality well, but rather what it can't. There are no apps for viewing YouTube or the plethora of other sites that would be good to access from your TV. Of course, this isn't a media centre, but it's so close to it that you can't help wishing you could just pop online to watch a few music videos and the odd funny cat clip. Despite these niggles, the PlayOn! 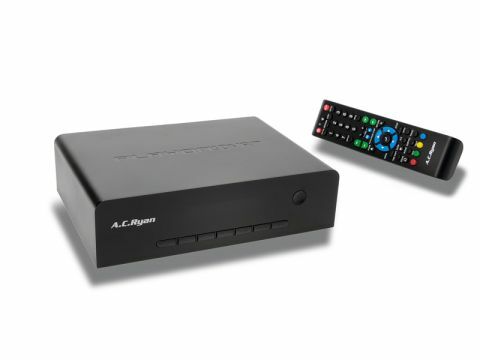 DVR is currently the best option for any tech-savvy person looking to slide a box under the television and enjoy all of their media on the big screen. The ability to record digital TV while you're at it is the icing on the cake. We just can't help wishing that it did more.